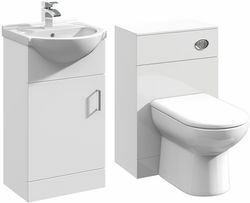 Italia Furniture > 450mm Vanity Unit With Basin Type 1 & 500mm WC Unit (White). Italia 450mm vanity unit in gloss white finish with ceramic basin (type 1) and 500mm WC unit. Floor standing design with single door. Quality 450mm 1 tap hole ceramic basin top (type 1). 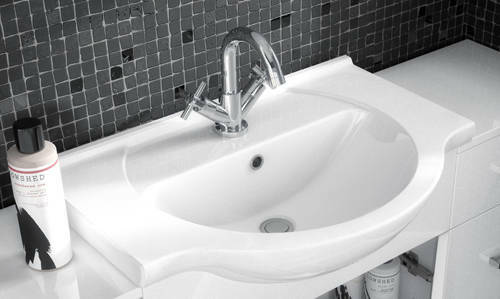 Basin type 1 with a curved bowl and wider sides for your toiletries. WC unit included (btw pan and cistern are not included). Rigid backboard and soft close doors (all you need to do is put the basin on top!). Mix and match collection for a truly clean and professional bathroom look (why not add a storage unit). Functional, attractive and high quality. Units hide away unsightly pipes and plumbing. Vanity unit size: 415W x 781H x 300D mm. WC unit size: 500W x 766H x 300D mm.